Google Classroom is not an LMS. It’s better. I have encountered many strong opinions about Google Classroom. The overwhelming majority of these are positive like my own. However, some colleagues dismiss it by saying it is not a Learning Management System (LMS). Even the leading expert on Google Classroom, Alice Keeler, says it is not an LMS. She argues that Google Classroom is neither an LMS nor a CMS (Content Management System) because it does not automate course enrollment, have a grade book, or house content. Alice Keeler is right. Google Classroom is not an LMS, it’s better. She goes on to define Google Classroom as “Google Drive Management.” This description is accurate. Google Drive Management is more valuable to students and teachers than what an LMS provides because Google Apps for Education (GAFE) are essential for collaboration and feedback. Students hone future-ready skills when they collaborate and give and receive feedback in the Google ecosystem. Google Classroom automates the distribution of Google Drive files. Conventional LMSs force teachers and students into time-wasting workarounds to access and share Google Drive files. Teachers are better off working in Google Drive than investing time building courses in an LMS the district might ditch a few years down the road. Even if Google Classroom goes out of vogue, all teacher files will still live in Drive. I know a teacher who has invested countless hours putting multiple choice questions into Moodle. If only he used Google Forms for assessment instead! Flubaroo would easily grade his assessments and he could copy and paste questions into Google Docs or Microsoft Word if he needed. Now his hard work is invested in an LMS that is falling out of favor. One drawback of Google Classroom is its lengthy Facebook/Twitter feed that makes reviewing old content difficult. LMSs have modules that make going back easy for students. Play around with them in your school’s LMS. They are organized like traditional file cabinets, not like 21st-century tools. Google Classroom is user-friendly and intuitive for students and teachers. But what about organizing units? Most students and teachers I work with like Google Classroom. I decided to poll my 7th-grade and 8th-grade literacy block students to generate some (admittedly crude) data about Google Classroom and LMSs used in my building. Check out their responses. Not a single student chose Google Classroom as their least favorite! Google Classroom will continue to grow and respond to teacher and student needs. These improvements are faster and more plentiful than growth in traditional LMSs. Care to discuss Google Classroom and other LMSs further? Comment below or tweet me at @edtechtom. Thanks for reading. Though Classroom shows lots of promise, there still seems to be a lack of parental involvement. Even Edline (ugh) gives parents a chance to be a part of the process. Am I missing something, or is there a “parent portal” possibility in the Google Classroom future? Doug, thanks for your thoughts. You are correct that there is no parent portal or log-in. I would argue the lack of such is benign or downright good. Here’s why: schools have to stop using parents as unpaid, unqualified homework counselors/enforcers. We have plenty of time with the students. We should honor family time and leave school work at school. On this one, I would rather the culture change than Google Classroom change. That probably was not the answer you were looking for but its the one I’m comfortable with. I agree. If a parent wants to peek into the virtual classroom, no problem…use the student’s credentials and have at it. Having a separate parent login seems like overkill. Erik, that’s even easier if the school is 1:1 and uses Chromebooks. Simply open device and click on Google Classroom icon. As far as grades and parent access are concerned, we have to make the shift away from grades and homework to honoring families and providing good feedback. What set of tools is awesome for providing feedback? Google Apps for Education! And it’s free. I have to disagree with your assessment. Parents are major stakeholders in the education process. I think that nearly all research indicates that parental involvement correlates to positive learning experiences, including higher graduation rates. I think summarily dismissing it is narrow sighted. Educators need all the help they can get. Classroom management is as important as the technology that we use. I appreciate your perspective, but I find your rationale lacking. Derek, thank you for sharing your thoughts. I have no problem with schools and families communicating. I dislike when that communication is based in grades and overdue assignments rather than the aspects of the child that make them a special member of the learning community. Its not intended for parents. It’s the students class. Google recommends making a Google site for your class and groups for your parents. Thanks for your observations and clarifications about Google Classroom. We are shifting from a home-grown workflow system developed before Google’s solution, and are now adopting Classroom school wide. I like that Google chose to focus on workflow. The teachers in my school are very happy with Classroom. The piece that seems to be missing, however, is the ability to assign to individual students (or groups) for purposes of differentiating instruction, particularly with the co-teaching feature. Our special educators would love to be able to create modified assignments and discreetly add them to Classroom. I know that this is a popular feature request, and I hope the Google developers are working on a solution. In the meantime, we are using Alice Keeler’s solution to differentiate: http://www.alicekeeler.com/teachertech/2014/09/14/using-google-classroom-to-differentiate-assignments/. I love Alice Keeler’s solution, but yes Sarah, Google Classroom does need to improve differentiation. Alice’s solution is really great! For the future, I’ve suggested this as a feature request to Google, which can be voted on here: https://connect.googleforwork.com/ideas/2557. When we talk about moving to Google Classroom at our school, our Tech Coordinator, a Moodle advocate, bemoans the lack of an interface in GC with Turnitin.com, which many of our teachers use. The interface with Moodle is seamless. Chuck, if your tech coordinator is concerned about Moodle and Turnitin.com, they probably need to get out to some Edcamps or build their PLN on Twitter or Google Plus. Students should be publishing their work to the web. That is much more compelling, relevant, and 21st century than submitting work on Turnitin.com. I would love to talk with you more about this. In education, we need to be open to change, not forever married to what was hip five years ago. My organisation is looking into expanding Google Classroom (currently used for 40% of cohorts) to areas where TurnItIn is still highly regarded and needed. Now investigating whether a self-coded GAS/API solution might be possible. Or whether GC / TII can be used in parallel. It would be useful to know what other organisations have done in this regard or if you have any tips. I haven’t used Turnitin with Google Classroom but I could see putting the link and class code in the About tab so students always have easy access. I agree with most of what you’ve said here. However, one thing that makes the “one ‘Classroom’ per unit” concept a bit tough is that students then have an extraordinary number of classrooms to keep up with, and there’s no way to sort all that efficiently. Each one also creates additional separate calendars, which clutters Google Calendar, and it’s more for the tech dept. or admins to oversee. Aaron, I agree that it’s not perfect and the calendar thing would be a little dicey but remember, a teacher would only be posting to one classroom at any one time in the student’s view. That means one calendar as well. Having lots of calendars can be annoying but not as much if a number of them have no events on them. Further, teachers should select an image to differentiate each unit and make it easy for the student to recognize. Interesting post. In the spirit of pushing teaching and learning forward, I’m going take a stand here in the comments. I suspect what I really need to do is write up my opinion as a separate blog post, so I’ll be brief. What doubfounds me is why so many Tweets, blog posts, updates, conferences and more celebrate and focus on the Tech tools over the teachers who use them and they use the tool effectively. Outside of teaching we focus on the person and the skills/methods. For instance Michael Jordan was a great basketball player. Nike would love for us to believe that it was because of the Air in his superior shoes. When really it was about his work ethic, mindset and physical traits. Let’s stop trying to sell one tool over another. They’re all useful and it matters way more on who is using them and how they use it. I know Alice and the one thing that stands out about her is her work ethic, creativity. She is a relentless learner. If she were to use Moodle, Schoology or whatever I guarantee you she would be successful with it. It would be like MJ putting on a pair of Addias to play a game. The survey results of your students aren’t really a surprise are they. Google Classroom has No grades and No parents breathing down their neck. As a student what’s not to like. I’ve used both Classroom and Canvas and lead professional training on both. I wonder if any of the students teachers using Canvas regularly leave audio or video feedback for their students using the SoeedGrader tool, or conduct virtual conferences, of allow likes in discussions or enable peer reviews? Or even have had students turn in one URL of a blog post, Flickr Gallery or somethings g else they have created. I kinda doubt it, but if the teachers were doing that with Canvas would that change the equation. So we go back to the practice and the Practitioner. Let’s hype up how teachers and students are using the tools. Rather than promote the tools themselves. Celebrate the learning! Chris, in some ways I agree, in others not as much. I strongly believe each teacher should use what makes them most awesome for their students. I have teachers who use Canvas and I’ve shown them features they did not know about. I’m speaking as someone who has a strong positive opinion about Classroom based on my experience changing my practice in the classroom with it. Just to clarify, I’m of the same belief. Use what you want to, just don’t sell yourself short. I love Nikes and that’s what I use but in reality that matters very little. It’s about how the tool is used and if any of these things were “easy to use” (which I believe they are) then why do schools have to pay “experts” to come in and show other teachers how to use them? The problem is that’s not easy to talk about, but that’s what we need to focus on! Very much agree with Chris. I wish I read as many posts about what teachers do with these tools as what the tools CAN do. We have many teachers using Canvas and many using Google Classroom. I feel like Classroom is our introduction to managing learning online. People then “graduate” to Canvas when they want to start using more personalized learning like decaying average mastery, unit prerequisites and either/or module requirements. These teachers also find that audio/video feedback in Canvas can develop some rich dialog between teacher and student. When people have reached the “limit” of Classroom instructionally and grow weary of app/extension work arounds for a variety of assessment and feedback purposes or otherwise, I’ll direct them to our Canvas accounts because many of those tools are integrated… Getting teachers to use them all purposefully is a different story. Corey, thank you for your comments. I agree it is important what teachers do with the tools. I will post about going deeper with Google Classroom (some next-level best practices) in January. I disagree about capability and ease of use. Having worked with both, I find the usability and capability of Google Classroom superior. This is, of course, an opinion. I hope to further support it with the forthcoming best-practices blog post. This is exciting, and I can’t wait to try it with my class! I am new to google classroom this break. Thanks for a quick helpful read. As far as navigating to past assignments, doesn’t the calendar function make this pretty easy? Good point. 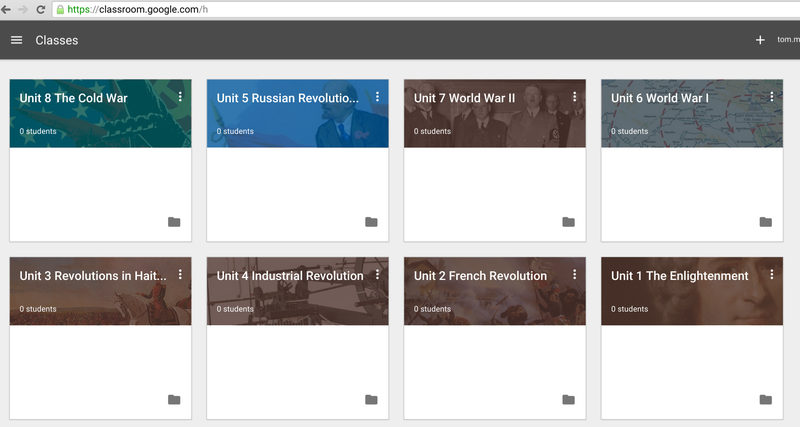 I still like the idea of having each unit be a separate classroom so students can access an entire unit in one click. I am a parent of a child who is required to read and answer homework on google classroom. Here is the problem that he has encountered. All of his reading comprehension life (he’s in 6th grade now), he has been taught to underline the relevant aspects of a passage and write the “gist” of each paragraph. He was never taught how to do this on google classroom. In order to answer the questions his teacher asks, he must scroll up to find the answer and then scroll down to start answering and continue this process until he is finished. We have resigned to printing out the readings he is given so he can do what he’s been taught all of these years and then enter his answers. All of this is very time consuming and not to mention the cost of printing out all of the pages each night (which is typically between 6-8). What does google classroom offer to help assist kids/parents who are facing these challenges? Watch this video (cued to the 6 min mark) https://youtu.be/Q24SR5tLC7o?t=6m to learn how to use it. Ignore the group stuff and focus on the highlighting and sticky notes. Having said that: This homework seems like a big waste of your family’s time. Know a couple of things about homework: There is no research that proves it is effective and teachers are never trained in giving homework. It’s a dated practice that serves no use. The assignment your child has seems particularly awful. I have twelve years in the classroom, regular and special ed, grades 4-12. I can think of no better way to make your child hate reading than this assignment. I would be very happy to discuss this with you further. Please comment again or tweet me @edtechtom if you want to continue the discussion. Good luck. I would be very happy to discuss this further. I am extremely thankful for your help thus far. I have many more concerns/questions with how my district is utilizing Google Classroom. I do feel that it is an amazing concept. I don’t tweet- sorry :(. Do you feel that teacher’s require any sort of training prior to implementing Google Classroom? If the reading is provided in a google doc, there is an easy comment function that would allow him to underline important passages and summarize chunks of reading. Another important skill for him to develop is using the find function. (control f). This will enable him to quickly find sections of text via key words and, more importantly, help him to develop his associative memory, a faculty that is so important in a world of digital texts. I teach my students to use Diigo, and from time to time we still print and annotate with a pen, but most of the material I push through google classroom is in google docs–highly searchable and easily annotated through the comment function. Learning to work with digital texts is planet friendly and future friendly. I’m a mom of six and an English teacher. This seems like a perfectly suitable homework assignment to me. Help your son to keep his focus on reading to understand, with the questions a way to test that understanding. Don’t let the answers to the questions be his primary goal. Thank you for the comment. I agree that digital is preferable to paper for the reasons you cited. We disagree with the value of that daily homework assignment. HW is not a research-based strategy! Thank you for all of your help. I also strongly disagree that it is a suitable homework assignment. It might very well be a fine homework assignment if I were an English teacher and could provide the immediate feedback, as he has had reading comprehension difficulties all of his life and is in AIS for reading and writing. I re-read my original post and I could not find where I was veering from having him NOT focus on his reading to understand. He utilizes the techniques I mentioned in order to help him understand his reading. I am an Occupational Therapist with 3 children- one being moderately Autistic. The different neurological pathways which are required to be successful with this assignment are not ones which have been utilized in this manner for my child’s academic career. I would rather him read the assignment on paper to make sure he understands the material being taught by his social studies teacher. The Classroom calendar is not “integration.” It creates and adds events to a calendar. But you cannot change or add events via Google Calendar. organization of content is a struggle for me. Do I have it right: create a new classroom for each unit, invite students to the new classroom as you move to new units? Does this get hectic for students to keep track of? I teach 11th-12 graders in chemistry so they can probably get it.New to this blended stuff. Thanks for this! Emily, good news! There are now topics in Google Classroom. Just give each assignment a topic and it is easy for students to review. No longer the need to create separate classrooms for each unit!